Soil is something that you can improve. If you have too much clay and what rain you get sits there in puddles, then you can put in compost (or barring that, put in bags and bags of peat moss); if your soil has too much sand (hello, Florida, New Jersey and Long Island, New York) and the rain just washes through, then you can put in … compost (sorry, but organic matter is the universal ‘fix-it’) or bags and bags of peat moss. Plants, like people, are mostly water. If there is not enough water, they won’t grow. If there is not enough water when they need it, even if they have grown, they’ll transpire whatever moisture they’ve got through their leaves and droop and perhaps die. The name of the game when growing plants is keeping the water in the soil so that the plants have access to it. This winter season, thanks to a combination of climate change and El Nino, we didn’t get the amount of snow we usually do here. Snow in the north is tremendously important to farmers and gardeners. It’s like a rain bank account that sits there, sheltering the soil and the plants over the winter and then slowly melts into the soil in the spring as the soil warms up. “Snow cover” as we call it here, is just tremendously important. When you have good snow, you know you will be going into the growing season with a good load of moisture in the ground. The seeds and plants will get a great start and will drive their roots deep into the soil where, even if conditions dry later, they will have access to moisture. 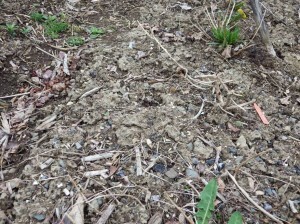 This spring, locally, we are not going into the growing season with good moisture in the soil. Yes, we are not like the western US, where the drought maps are showing all the nasty colors on them, especially in places such as California. But, bad enough. We’re on burn bans now – no outdoor burning at all. Normals for us, in terms of precipitation are 17″ between November and April. So far, between November 2015 and yesterday (April 22, 2016), we’ve gotten slightly over 12″. Being 5″ below normal is a very big deal. 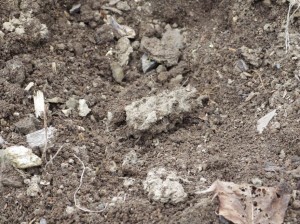 This is my soil, 4″ down. Usually, at this point, I’m debating if the soil is too wet for me to put in seeds for broccoli, cauliflower, cabbage, beets and chard. The soil is certainly warm enough for me to put those seeds in, but the soil, although it looks really good – loose, not clayey or clotty (usually, I can grab a handful, squeeze it and it will hold together from the moisture) – is really…just…too…dry. I’d have to soak that bed with water from the hose before I planted anything. 1) (and you’ll be tired of reading this…again) Put in more compost. We have three huge compost bins going all the time. Every vegetable scrap, every weed (except the ones with the white roots – those seem to live forever), every leaf off the trees that fall, etc. goes into those compost bins. When we had livestock, we’d through in some of the dried manure as well. We’ll empty the compost bins into the beds. If we’re really desperate, we’ll go get bags of peat and put those in as well. 2) Once the plants are in and the seeds are up, we’ll mulch the heck out of everything to hold the moisture into the soil. Some people use cover crops to do this and plant straight through those. Cover crops (particularly those that are sown in the late summer and early fall and then are killed by the frost) hold the soil, pull up minerals and nitrogen from subsoils, and protect the soil from loss during the winter from rain. All are great for adding organic materials to the soil; some are terrific also for driving long roots into subsoils and improving the physical make up of the soils as well as their chemistry. We have access to composted wood chips for free from our township, so we go get garbage cans of that and use that as a mulch. Now, there are plastic mulches around (and of varying colors as well, which supposedly are great for plants such as tomatoes), but we figure we use enough plastics around and don’t want to add any more to the soil, so we go with an organic mulch. Additionally, with plastic mulches, the only access to moisture that plants have will be through the hole they occupy in the mulch, so you need to put in some sort of drip irrigation underneath it, another reason to go with an organic mulch. How are soil conditions where you are?